Senator Munson and MP's Thibeault and Stoffer have been fighting for a National Autism Strategy for several years. As World Autism Awareness Day approaches this "autism dad" says thank you. Ari Ne'eman, and all of those persons who oppose research aimed at finding treatments and cures for autism disorders, oppose the right of choice of autistic persons and their families. Mr. Ne'eman and his supporters oppose the right of other autistic persons to seek to be cured of their autism disorders. In Mr. Ne'eman's case he has clearly stated that HE does not want to be cured of his Aspergers Disorder and I respect that right as I am sure everyone does who is involved in debates about his disability council appointment. Unfortunately Mr. Ne'eman takes it a step too far and asserts that not only does he not want to be cured but other persons with autism disorders do not want to be cured, should not be cured and should not have the option and right to choose not to be cured. When Mr. Ne'eman says to his many high profile media contacts that WE do not want to be cured he purports to represent all persons with autism disorders, even those much more severely affected by autism than he is, which is almost everyone with an autism spectrum disorder. He has no such authority to speak on their behalf. When he makes such statements he is attempting to prevent the research from being done that is necessary to finding treatments and cures for autism disorders thus hoping to deprive autistic persons and their families of the option and the right to choose to be cured. When he protests parent driven organizations seeking to raise funds for research aimed at curing autism disorders Mr. Ne'eman is again seeking to prevent that research and to deprive other persons with autism disorders of their right to choose not to be cured. 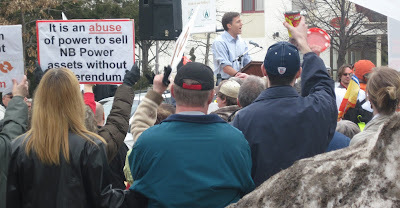 When he describes as morally reprehensible, as he has done, efforts to cure autism disorders, Mr. Ne'eman, the high functioning university student with Aspergers is trying to deprive other persons with autism disorders, or parents rightfully acting on their behalf, of the option and right to choose to be cured of their autism disorders. Mr. Ne'eman does not respect the rights of other autistic persons to choose to be cured, to overcome the limitations of their autism disorders. He does not respect the right of parents acting on behalf of their autistic children, some with severe Autistic Disorder, to overcome those deficits through treatment and cure. When it comes to cure oriented autism research Mr. Ne'eman seeks to deny to other persons with autism disorders the same freedom of choice ... to be cured or not ... that he asserts on his own behalf. I am astonished and disappointed that US President Obama, who I greatly admire for so many other reasons, would appoint to an important disability council position a person who opposes the right of choice of other persons with autism disorders and the parents who often, by necessity and by law, act on their behalf. The Autism Action Network has called for its American readers to contact their Senators to voice their opposition to US President Obama's disability council nominee Ari Ne'eman. I wish them success although from what I understand the nomination is unlikely to be disturbed. This Canadian father of a severely autistic son is very disappointed that Mr. Ne'eman will ultimately be approved and will be in a position to influence autism policies in the US and consequently around the world. I have followed with great interest the US Health Care debate and President Obama's historic struggle to bring health care to all Americans. I am perplexed that the great US health care president would, at the same time, appoint to an important disability council a very high functioning person with Aspergers who does not believe that autism is a medical disability or disorder and is opposed to curing autism spectrum disorders. Mr. Ari Ne'eman does not view autism disorders as disorders in a medical sense notwithstanding his own medical diagnosis of Aspergers Disorder. Nor does he restrict himself to rejecting a cure for himself, or for other very high functioning persons with Aspergers Disorder. He tells the world that all autistic persons do not want to be cured. "June 10, 2008 on Good Morning America, Neeman said, "We do not think to aim for a cure is the right approach to take." December 10, 2009 interview with the CBC, "Autism is currently viewed as a disease of the medical model---Something to be cured or eliminated. That doesn't reflect how we view ourselves, that doesn't reflect our realities." In his essay Equality Demands Responsibility, 2006, Ne'eman wrote, "But if we are to demand equal legitimacy, if we are to assert that a 'cure' is not only unnecessary and undesirable but morally reprehensible, then we must accept for ourselves equal responsibilities."" This very high functioning gentleman does not seem troubled by his Aspergers disorder but there are many low functioning persons with severe Autistic Disorder who do suffer. Some never survive to the age of 12, the age at which Mr. Ne'eman apparently received his Aspergers diagnosis. Some are lost forever in local traffic, neighborhood pools or snow storms. Some require intensive therapy to prevent dangerous self injurious behavior. Some live their lives in institutional and residential facilities dependent on the care of strangers. The young university student with a very mild variety of Aspergers disorder opposes curing those with more severe, restrictive types of autistic disorders and purports, with no common experience and no legitimacy, to speak on their behalf. Mr. Ne'eman speaks about "our" views, "our" realities, how "we" view "ourselves". My son has an Autistic Disorder diagnosis, assessed with profound developmental delays. He is severely autistic. Mr. Ne'eman the high functioning young university student with Aspergers, and the abilities to interact regularly with the New Yorker magazine, the NYT and Canada's CBC AND negotiate socially in Washington DC political circles does not know how my son thinks or views himself. Mr. Ne'eman does not have any knowledge whatsoever of my severely autistic son's realities. When he claims to speak on behalf of all persons with Autism Spectrum Disorders he is misrepresenting himself, and autism disorders, to the world. Personally, I find Mr. Ne'eman's opposition to curing the autism disorders that afflict so many children and adults to be morally reprehensible and I am very disappointed in US President Obama for appointing him to a position from which he can influence the lives of so many persons with autism disorders. I do not pretend to be a fan of the New York Times autism coverage but I acknowledge that its article on Obama disability nominee Ari Ne'eman gets it ... about half right and for that this humble autism dad awards the NYT a D- grade. I must admit that the NYT made a better effort than usual in providing some semblance of objective balance before telling parents what autism is all about in Nominee to Disability Council Is Lightning Rod for Dispute on Views of Autism. But the NYT still fails to demonstrate actual knowledge of an important autism research issue and fails to acknowledge the biggest issue of all ... the right and responsibility of parents to represent the interests of their children; not some stranger with no professional expertise and little in common with their children. The NYT does gently acknowledge, while down playing it somewhat, that Mr. Ne'eman is a high functioning young university student of obvious intelligence and excellent communication and organizational abilities unlike many of the severely autistic children and adults on whose behalf he claims to speak. He can, unlike severely autistic persons like my son, operate smoothly in the worlds of high powered Washington politics and the ultra influential New York media . What the NYT fails to fully address is the fact that Mr. Ne'eman purports to speak on behalf of other people's children and that he does not show respect for the role of parents in raising, caring for, and representing the best interests of their children..... unless of course they agree with his views of what is best for their own children. The NYT also presents Mr. Ne'emans simplistic and erroneous views about autism research. It is true that most autism research is genetically oriented. Public health authorities that influence autism research funding decisions have insisted on genetically based autism research for more than a decade as described by Teresa Binstock who called that mindset the "It's Gotta Be Genetic" model of autism. What the article misses by quoting Mr. Ne'eman's views of autism research is the growing push for environmentally based autism research and for treatments and cures other than termination of "high autism risk" pregnancies. It is imperative that resources be devoted to research commensurate with the public health need. Specifically, we need research that deepens our understanding of ASD, including the complex genetic and environmental factors that play a role in its causation; development of improved ASD diagnostic approaches and treatments; and science to enhance the level of services and supports available to people with ASD, their families and caregivers. With current scientific knowledge and tools, we have unprecedented potential for discoveries that will improve the quality of life for people with ASD. When Mr. Ne'eman tells the world that WE don't want to be cured he purports to speak on behalf of all persons with autism disorders including the severely disabled. When Mr. Ne'eman protests a video by parents describing autism from their perspectives as parents of severely autistic children he is opposing their right to speak on behalf of their children. When he protests Autism Speaks he is opposing efforts to increase autism awareness and raise funds for autism research goals supported by many parents and families with autistic loved ones. Hopefully some day the NYT will have an epiphany and come to understand that Mr. Ne'eman opposes the right and responsibility of parents of children with autism disorders to seek treatment and cure for their own children. He is obstructing their efforts to give their children the best, fullest lives they can. Hopefully someday the NYT will come to realize its own role in promoting such efforts to interfere with and obstruct the efforts of families trying to help their own autistic children. Conor, Mom and Dad often head out for a walk along the trail to the Superstore early Saturday morning just to stretch the legs, get some fresh air and pick up some essentials. This morning was one of our colder mornings in a while with the official temperature at -13 Celsius and -21 with a wind chill. We were walking into the wind along the river trail heading to the Superstore but we were dressed for it. Conor didn't mind the cold too much as long as he didn't have to wait too often for old Dad to catch up. April 2 is World Autism Awareness Day. On WAAD 2010 I ask that you remember the original autistics. The original autistics are those low functioning persons who would have been diagnosed with autism BEFORE the DSM IV expansion of autism to include Aspergers disorders. Between 75-80% of the original autistics are intellectually disabled. The alleged autism self advocate organizations seldom include the low functioning original autistics in their portrayals of autism, they do not talk about them in polite company, when they pose for their many media interviews, or when they socialize with Washington DC politicians and bureaucrats. They object to people who describe the realities of severe autism disorders. The DSM5 revisions will continue the DSM IV expansion of the "autism spectrum" .... on the high functioning end of the spectrum. At the low functioning end of the autism spectrum those with intellectual disabilites will be rendered completely invisibile, swept under the autism spectrum carpet into a separate category completely. There will be no mention of intellectual disability in connection with the autism spectrum. On World Autism Awareness Day remember the original autistics, those severely affected enough by their autism that the condition came to be known as a disorder. Increasingly, and with the kind assistance of the DSM revisions, autism as a disorder is disappearing and being described as just a different way of thinking. Low functioning autistic persons will be swept completely into an intellectual disability category and removed from the autism spectrum. The decision to remove the low functioning original autistics from the autism spectrum has already been made and the public comment section of the DSM5 web site will not change that one iota.In the DSM5 era they will no longer be considered autistic. 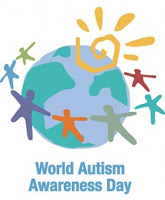 Whether for historical reference purposes, or out of solidarity with those who are severely affected by autism disorder, please remember the original autistics this World Autism Awareness Day. This request is made by the father of a 14 year old low functioning autistic son. He is one of the original autistics. 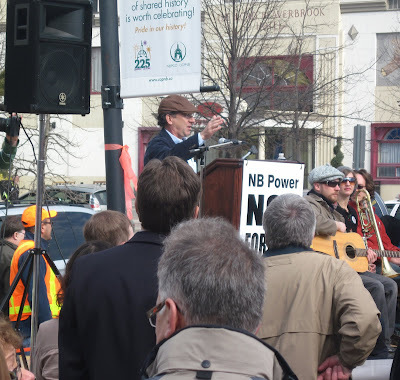 Some pictures from the NB Power Protest at the Legislature this afternoon. Protesters left gifts for MLA's backing the NB Power deal with Hydro-Quebec. They signed pink slips terminating the MLA's and giving them the boot. All the speakers, including Tom Mann a protest organizer gave impassioned, articulate speeches. NDP leader Roger Duguay was present carrying the NDP sign. Opposition and Conservative Party leader David Alward was also present. "I don't have an autistic child but I taught at a school for autistic kids for two years. I find it unbelievable that a parent of a child who head bangs, gnaws his own wrists until they're bloody and who is unable to speak or communicate would not want her child to be normal. I know that normal people suffer, too, but severe autism is a horrible scourge. I'm not talking about Asperger's but severe, incapacitating autism, the kind that makes kids howl in torment for hours at a time. That kind of autism isn't merely a different way of relating to the world, it's an affliction that ruins lives. Of course I would love him if a child of mine had that kind of autism but I would not pretend that I would not give anything I had for him to be able to speak and live in the world as an independent, contributing member of society. Those parent who pretend to be thrilled that their child has severe autism are lying." I have been publicly proud of this beautiful province of New Brunswick when it comes to helping autistic school children and pre-schoolers. For those age groups I would stack New Brunswick's autism services and real accommodation up against any jurisdiction in North America, even better funded jurisdictions like oil rich Alberta and traditional Canadian economic hub Ontario. When it comes to taking care of autistic youths living with the challenges of autism and Aspergers though New Brunswick is in very bad shape and has absolutely nothing to brag about. In New Brunswick we have an ad hoc system of residential care which has seen New Brunswick adults with autism shipped out of province far from families who love them. We have seen some NB adults with autism living on a hospital ward (information conveyed to me but unconfirmed). We have seen NB autistic youth and adults whose aggressive behaviour even with family members end up in jail facing assault charges. On some occasions family members are urged by Social Development workers to press charges since the Criminal process will often result in a psychiatric assessment not otherwise available from public funds. The most severely affected by autism reside in a psychiatric hospital in the non central, Northwestern corner city of Campbellton again far from most family members living out their lives. I have visited that hospital and saw caring people in charge but people who have to deal with limited resources. Things to day are not much different than they were 5 years ago for New Brunswick's autistic adults severely affected by autism who require residential care and treatment. 4 1/2 years ago New Brunswick was infamous for housing an autistic youth charged with no wrongdoing on the grounds of a youth correctional center in Miramichi pending his transfer to the Spurwink facility in the State of Maine. As the Toronto media headlines faded away, so too did the apparent willingness of government to provide a decent residential care system for New Brunswick adults with autism. I have been part of a contingent of autism representatives that has surveyed the needs of our autistic population and presented our suggestions to government to consider on severeral occasions. Still no action. Still nothing to help our autistic youths and adults in need of decent residential care and treatment. 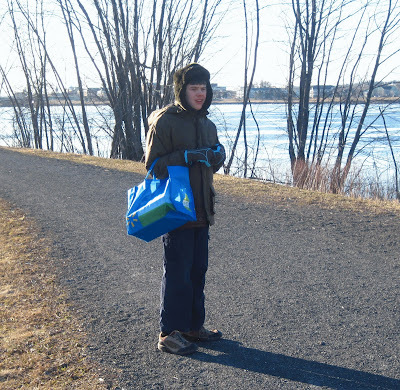 Following is a Toronto Star article on the incident 5 years ago that saw the autistic youth residing on the grounds of a correctional facility because there was nowhere else for him to go in the Province of New Brunswick. The political standings have changed during the past 5 years in New Brunswick. Mr. John Foran has been part of a Liberal government in power for almost 4 years now. The Liberal government of Premier Shawn Graham, especially former Education Minister Kelly Lamrock, has done much to improve the lives of New Brunswick autistic students and pre schoolers. But for New Brunswick's autistic youth and adults in need of decent residential care and treatment it is a different story. 5 years ago things were desperate. Little has changed since then for New Brunswick's autistic youth and adults who have been so badly in need, for so long, of a modern comprehensive residential care and treatment system. Will US Injunction Help Focus on Residential Care Needs of Persons with Autism in New Brunswick? The United States has concluded that children at the facility are particularly vulnerable given allegations that CHDC residents are subjected to dangerous medication mismanagement and harmful, unnecessary restraints. In recent years, at least three CHDC residents have died, suffered possible permanent organ damage or been at risk of hemorrhaging to death because of psychotropic medication mismanagement. CHDC also continues to utilize 41 different forms of mechanical restraints on both children and adults, including straitjackets, restraint chairs and papoose boards - practices that have been largely barred from other facilities for years. "The State has a responsibility to ensure the safety of individuals who reside in state-run facilities, and we must act swiftly when the state does not live up to that responsibility," said Thomas E. Perez, Assistant Attorney General in charge of the Civil Rights Division. "Individuals with developmental disabilities have the right to live in the most integrated setting appropriate to their needs, and states must take swift action to ensure that all individuals are accorded these basic rights." In addition to barring inappropriate restraints and requiring safeguards to prevent dangerous medication practices, the motion seeks to require that the state remove barriers to the provision of supports and services in the community, so that individuals with disabilities, including the approximately 50 children at CHDC, are not forced to choose between an unsafe institution and the denial of necessary services in a more integrated setting. The proceedings against the State of Arkansas, and against the facility in Conway Arkansas, could have an impact in Canada; including here in New Brunswick. New Brunswick has been examining its residential care system for youths and adults with disabilities for several years but to date very little action has been taken. Approximately five years ago a youth with autism was housed temporarily on the grounds of a youth correctional center at Miramichi pending admission to the Spurwink facility in neighboring Maine. I have, since starting this blog 3 1/2 years ago, received unconfirmed information that an autistic person was essentially living on the floor of a general hospital in Saint John New Brunswick. I have visited the premises of the psychiatric hospital in Campbellton New Brunswick where persons with autism and disabling mental health conditions currently reside in New Brunswick. It is not a future I want for my son even though the persons running the facility who I met, and who were generous with their time, showing me around the facility, impressed me with their knowledge, compassion and attempts, within the existing system and resources, to care for the residents. I would rather see my severely autistic son reside in Campbellton once I am deceased than live in a facility lacking properly trained staff and security. But it is not what I want for him. I want very desperately to know that he will live in a secure facility properly staffed and centrally located. A Fredericton location would enable the operators of the facility to more readily access the professional, academic and government resources available in Fredericton and provide residents with access to the community and the wonderful natural environment with which we are blessed in the Fredericton area. Representations have been made to the Province of New Brunswick from autism community representatives, including me, and from several professionals involved with actually helping autistic youths and adults in New Brunswick, asking the Province to provide a modernized residential care system for autistic youth and adults. The representations have been made formally and informally, directly and through the media, for several years but, to date, there has been no sign of progress. New Brunswick needs a modernized, secure residential/treatment facility to care for those most severely affected by autism and developmental disorders located centrally in Fredericton where the facility would have access to the professional and academic resources of the Stan Cassidy Center and the University of New Brunswick. For those persons with autism whose abilities permit New Brunswick needs modern, community based facilities in each area of the province. Hopefully developments in Arkansas will focus attention on the need to take action to provide modernized, residential care facilities appropriate to the needs of autistic children, youths and adults in New Brunswick. The Justice Department today asked the Federal District Court for the Eastern District of Arkansas to take immediate action to prevent children from being admitted to the Conway Human Development Center (CHDC) in Conway, Ark. The department’s motion for preliminary injunction aims to prevent the segregation of children with developmental disabilities in dangerous conditions and to address accusations of imminent and serious threats to the safety of the facility’s more than 500 current residents. In January 2009, the Justice Department filed a complaint against the State of Arkansas to enforce the federal requirement that individuals with disabilities be served in the most integrated settings appropriate, and to remedy unconstitutional conditions at CHDC. Information collected through discovery since the filing of the complaint has led the department to conclude that residents face increasing and grave risk of harm with each day that deficiencies are ignored, and that Arkansas fails to serve individuals in the most integrated setting appropriate to the residents’ needs. Between June 1, 2007, and Oct. 1, 2009, a CHDC resident was more likely to die than be discharged to a more integrated setting. On average, CHDC residents die at the age of 46.5 years, compared with the average age of 72 years for other individuals with developmental disabilities living in institutional settings. The number of individuals with developmental disabilities who are waiting to receive community-based services is on the rise in Arkansas, with over 1,300 currently waiting to receive services through the Centers for Medicaid and Medicare Services Alternative Community Services waiver program, with an average wait time of approximately two and a half years. The Civil Rights Division is authorized to conduct investigations under the Civil Rights of Institutionalized Persons Act (CRIPA) and the Americans with Disabilities Act of 1990 (ADA). CRIPA authorizes the Attorney General to investigate conditions of confinement in certain institutions owned or operated by, or on behalf of, state and local governments. In addition to residential facilities serving persons with developmental disabilities, these institutions include psychiatric hospitals, nursing homes, jails, prisons and juvenile correctional facilities. The ADA authorizes the Attorney General to investigate whether a state is serving individuals in the most integrated settings appropriate to their needs. Please visit http://www.justice.gov/crt to learn more about CRIPA, the ADA and other laws enforced by the Justice Department’s Civil Rights Division. Autism Speaks has responded to my comment concerning publication of my comment on the official Autism Speaks blog site about the views of new Autism Speaks board member John Elder Robison. AS did, subsequent to my initiial comment on this site, post my questions to new Autism Speaks board member John Elder Robison. Mr. Robison also answered very honestly my questions on the Autism Speaks blog although I am very concerned about what his answers portend for the future direction of Autism Speaks. "It is essential that our grant funding reflects the needs and perspectives of the community we serve, namely, people with autism spectrum disorders. We are very pleased to welcome John to our scientific review boards. His insight and skills will prove invaluable." Mr. Robison is, like Ari Ne'eman, a very high functioning person with an Asperger's Disorder diagnosis. Autism Speaks, as stated in its announcement, feels that Mr. Robison's Aspergers condition permits him to offer insights on behalf of all persons with autism spectrum disorders. The autism spectrum, at least until the DSM 5 comes into effect, includes low functioning persons with Autistic Disorders. At least 75-80% of persons with Autistic Disorder have been estimated by credible studies and agencies such as the Canadian Psychological Association and the CDC to have an Intellectual Disability. How the unquestionably talented and very intelligent Mr. Robison will offer insights into the life challenges, needs and perspectives of those with Autistic Disorder is not explained by Autism Speaks and is not a proposition that I accept as the father of a son with severe Autistic Disorder. Of course, from Mr Robison's perspective he is better suited to represent my son's interests than I am as his father. "I guess I’d counter with a question of my own. What makes you think a person who cares for a disabled autistic person is better qualified to speak on their behalf than me, a high functioning autistic individual? Caretakers all too often have their own agendas at odds with the people they supposedly care for. They want to read a paper; their charge wants to keep practicing. There is always the temptation to do what’s easiest for the caretaker rather than what’s best for the care-taken person. There are so many cases of caretakers abusing or neglecting their charges and forcing unwanted therapies on disabled people that I would not be so quick to assume caregivers should have the exclusive right to speak on behalf of the disabled. That said, I know there are many loving caretakers out there who are truly in tune with what their disabled charges want and need. I would give considerable weight to their opinions if I were in a situation where that was appropriate. But that is not what I joined the board to do. I am not there to judge anyone else, or speak on anyone’s behalf. I am there to render my own perspective on proposed scientific research and treatments studies, as an autistic person at my particular level of functionality. A better question to ask might be: Should Autism Speaks seek individuals with a greater degree of autistic disability to serve beside me on these boards. In my opinion, the answer to that is yes and I hope to see that achieved in the future. The same reader asked a second question: Do you support research aimed at finding cures for autism? All of the science to date says autism is founded in structural differences in the brain. Differences are stable things. They are not diseases in need of a cure. Taking away the difference is – to me – tantamount to changing to another person. In any case, the idea of such brain configuration is in the realm of science fiction today. Having said that, I am well aware that autism presents some of us on the spectrum with virtually insurmountable challenges from crushing levels of disability. Others – like me – grow up with milder but still significant components of disability. As much as I recognize my own unique gifts I never lose sight of the “hard parts;” the reason autism is a disability condition. That is precisely the reason I joined the Autism Speaks boards. I want to bring my autistic perspective to the boards that choose how to allocate our limited research dollars to the best benefit of people living with autism today. For that reason I fully support research to develop ways to remediate the things that disable us. For example, I have written extensively about research I’m involved with that’s aimed at minimizing social disability by helping us read nonverbal signals that we were previously blind to. I am working with the scientists at Beth Israel Deaconess to develop a study to improve language comprehension and expression in people with autistic speech impairments. I support research to help alleviate the gastric distress that plagues many of us. However, none of those things are “cures for autism.” They are studies aimed at attacking specific challenges autism presents us. While I have high hopes that we can remediate certain autistic disabilities, I believe our underlying autism will remain. I am not aware of any proposed research that can change that reality. That’s where acceptance comes in. I want therapies that can help free people from disability. At the same time, I believe we have the right to be recognized in other ways as different but equal in larger human society. Through the efforts of Autism Speaks and all of us within and without the advocacy organizations I hope to see that goal furthered as well." Without responding, at this time, to all of the points raised by John Elder Robison in his reply to my questions I do thank him for stating clearly and honestly that he is opposed to research aimed at curing autism. And he does pay lip service to representing the perspective of an "autistic" (Aspergers) person with his particular level (very high) of functionality) he does not restrict the content of his views to that perspective. He does not, for example, oppose allocation of research funds for curing Aspergers Disorder alone; he opposes allocation of research funds aimed at curing autism a concept which he derisively dismisses as science fiction. To the parents of severely autistic children who are seeking autism cure oriented research from Autism Speaks Mr. Robison has an answer. Hey, some parents and caregivers do not act in the best interests of their charges, their children in the case of parents. Therefor better to let John Elder Robison who doesn't actually know your children or charges, who doesn't share their condition speak on their behalf. The primary concern I have with Mr Robison's views is his opposition to research aimed at curing autism. If those are his views then it is a clear indication that Autism Speaks will not be using the research dollars that it solicits, including the money solicited from parents of severely autistic children, to back cure oriented autism research. "Autism Speaks was founded in February 2005 by Bob and Suzanne Wright, grandparents of a child with autism. Since then, Autism Speaks has grown into the nation's largest autism science and advocacy organization, dedicated to funding research into the causes, prevention, treatment and a cure for autism." In the section titled Our Mission Autism Speaks states"
"We are dedicated to funding global biomedical research into the causes, prevention, treatments, and cure for autism"
It is difficult for me to understand how the mission of Autism Speaks to fund research into curing autism disorders can be reconciled with the views of its new board member and scientific and research advisor that autism can not, and should not, be cured, that the idea of curing autism is ... science fiction. Hopefully, in future news releases, Autism Speaks will confirm whether it will, or will not, continue to raise funds for research aimed at curing autism. Hopefully they will do so before they ask members of the public, including the parents of autistic children that AS Board member Robison holds in such low esteem, for contributions.